Northwestern Formula Racing team gears towards success. A deep rumble cuts across campus. Shaking and rattling, zooming past campus walkways, with glowing Northwestern purple lights from under the belly, NFR15 is a black bullet shaped racing car designed and built from start to finish last year by Northwestern students. The car zooms through the campus garages easing through spirals, donuts, and sharp turns coming to a pause to the eruption of cheers by the Northwestern Formula Racing team, the tinkerers and molders who created the vehicle. NFR is a student organization now in its tenth year, which builds and tests a formula-style racecar every year. The group is essentially a student-run car manufacturing company where every detail from design to production is deliberated and handled by students, all in line with the official rules which span over 100 pages. The rules are set by Formula SAE, which is one college-based competition organized by SAE International, a global association of engineers in transportation fields. The group also hosts Formula SAE competition where 120 student designed cars come together in a series of races that judge the design, acceleration, efficiency and endurance of the student made cars. The most extraordinary part? Starting from zero. No money, no machine, zip. Just intuition, faith, innovation and a ticking clock to create a full-blast racing machine. NFR is just one of the several campus groups dedicated to car building and racing. Baja SAE, for example, focuses on surviving the toughest punishments of off-road terrain, from snow to hills and even bogs. NUSolar focuses on integrating a complex electrical system from an array of solar cells in order to compete, pioneering ecological vehicle designs. 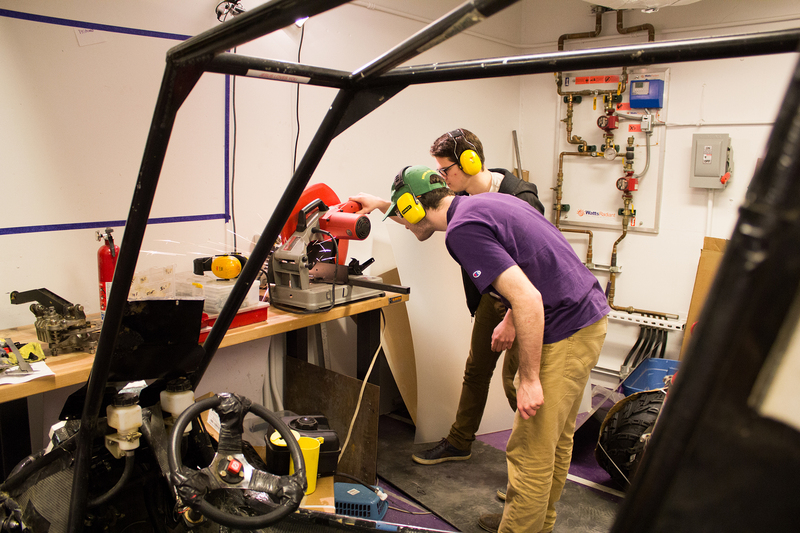 Despite logistical differences, these teams share a diligent work ethic that includes all-nighters and over 50 hours a week when it comes time to finalize a build. As the team prepares for FSAE Michigan in mid-May, largest and longest running FSAE international competition, they build upon the lessons of past years. The team has learned the hard way that the massive time commitment doesn’t always ensure success. Since then, with rolled up sleeves and full dedication, 2015 became NFR’s strongest year yet. The car exceeded past marks in competition and won the best pushbar award for their smart design of the part of the car that allows the vehicle to turn. This year with their eyes on the prize, the team is bigger than usual and has added changes to the NFR16 such as enhanced aerodynamics, suspension and a pedal box. The team’s goal for the upcoming competition is to finish the endurance race this year, a tough feat that barely a quarter of the teams reach. “We’re trying to be up there with the faster teams this year. Now is the prime time for NFR,” says Ana Acevedo, a second year member of NFR. Seeing a car zoom by on a highway or watching NFR’s latest model whiz along Sheridan, it is not easy to see the extensive brainwork, handwork and time that is invested into making a growling and tough engine or an elegant and aerodynamic frame. NFR does that every year, with nine months to breathe life into an idea, formula and metal. Months are spent working away at the Ford shop or test driving at the NFR garage in Henry Crown Sports Pavilion. Every detail is considered and reconsidered, in fact only engine team members drive the vehicles for their attentiveness to the nuances in the engine’s gurgle. Tracking the progress of Northwestern Formula Racing as the group pulls an all-nighter to finish building a car. McCormick students build their own cars for Formula One racing.